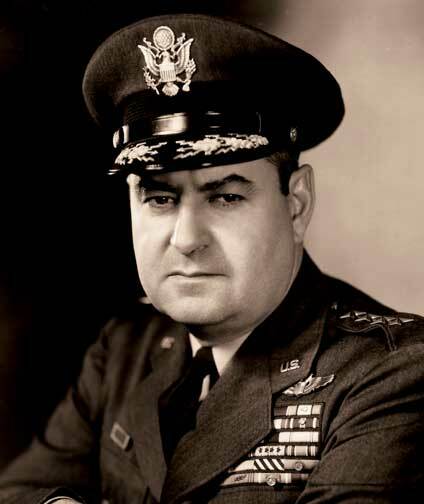 Curtis LeMay (1906-1990) was a United States Air Force general. LeMay is known for designing and implementing the systematic strategic bombing campaign in the Pacific Theater during World War II. LeMay was stationed in the European theatre early in the war, where he became famous for his intense, relentless leadership style. LeMay personally led many of the missions he directed, and demanded similar devotion from his pilots, who he threatened to court-martial if they aborted. These missions included risky attacks on Axis air bases in Germany and North Africa. By 1944, he had been promoted to major general and given responsibility for all air operations against Japan. Initially, this meant supplying forces in China via India by flying over “the Hump”: the Himalayas, the world’s highest mountain chain. Even with the newly-developed B-29 Superfortress, designed for long distance flights, this was dangerous and inefficient. Effective bombing raids on Japan would need a base for operations that was not just closer to Japan, but also easier to supply. New bases became available in mid-1944 as US forces captured the Marianas; within months Tinian Island was home to the world’s largest air base. It was from Tinian that LeMay pioneered his strategy of low-altitude nighttime firebombing raids. The first of these, on March 10, 1945, had more than 300 B-29s drop a variety of incendiary bombs in a massive X pattern over several hours. More than 100,000 people died in the resulting conflagration. LeMay subsequently directed similar raids at every major industrial city in Japan: sixty-three cities and hundreds of thousands of civilians were burned by the war’s end. Sustained, massively destructive bombing of Japanese cities was routine by August 1945. Thus, some historians have argued, neither President Truman nor other military officials saw dropping Little Boy and Fat Man as moral decisions at all. After the war, LeMay was appointed as a Deputy Chief of Air Staff for Research and Development to investigate the delivery process for the United States’ growing nuclear arsenal. From his position in the Army Air Forces, LeMay directed the first bomb tests at Bikini Atoll in 1946. The very first test was something of a failure; the bomb missed its target, an empty battleship, and exploded underwater with little spectacle or apparent damage. Though criticized by rival Navy commanders, LeMay was impressed by the explosion he saw. It strengthened his conviction that nuclear weapons had the power to destroy entire societies, and that, to be used, there must be an effective delivery method. LeMay transferred to Strategic Air Command in 1948, where he took responsibility for training the atomic striking force. His goal was to build a deterrent force to have a striking capability strong enough that the Soviet Union would never dare go to war with the United States. LeMay focused on disciplining and expanding the Strategic Air Command. He dissolved SAC units and reassigned the best pilots to atomic strike groups. He ordered arduous exercises, like a 96-hour nonstop flight around the world, featuring aerial refueling. In June 1950, LeMay directed a massive maneuver, involving dozens of B-29s, to simulate bombing the Soviet Union. Out of seventeen American cities that served as targets, the bombs “hit” every one. Only three weeks later, North Korea invaded South Korea. LeMay’s Strategic Air Command was ready to bomb North Korea, except for one crucial step: it had no nuclear bombs. Though the military protected the bombs with guards and fences, it did not have access to them. LeMay said in retirement, “These bombs were too horrible and too dangerous to entrust to the military. They were under lock and key of the Atomic Energy Commission.” LeMay wanted bombs ready to be loaded into the hatches of his bombardment crews at any time. Dropping nuclear bombs on major North Korean cities was also LeMay’s idea to force an end to the Korean War at its inception. His superiors demurred; such an attack would be too bloody, and cost too many civilian lives. In later years, LeMay recalled this with bitter irony. After China entered the war in late 1950, McArthur ordered strategic firebombing of North Korean industrial targets, most of which were located in heavily-populated cities. American aircraft dropped high explosives and napalm on North Korean urban areas, burning hundreds of thousands of Koreans. They also bombed irrigation dams, destroying North Korean agriculture, which resulted in widespread famine and massive civilian casualties. LeMay continued to be a strong advocate for use of nuclear weapons. During the Cuban Missile Crisis, LeMay tried to goad President Kennedy into bombing the missile sites in Cuba. LeMay believed that a massive display of US force would force the Soviets into capitulation. Kennedy was more cautious; the blockade worked and the crisis passed. Early in the Vietnam War, he advocated widespread bombing of key North Vietnamese industrial and military targets; President Johnson thought that this would draw the USSR and China into the war. LeMay wanted to threaten to North Vietnam that they stop aggression or “We’ll bomb them back into the Stone Age.” Outspoken and unpopular, he retired in 1965. During the 1968 election, LeMay joined Alabama Governor and infamous segregationist George Wallace as vice-presidential running mate. Wallace and LeMay ran as part of the newly-established American Independent Party. Both were controversial candidates: Wallace opposed federally-enforced desegregation, while LeMay called for use of nuclear weapons on North Vietnam. They won 13.5% of the popular vote and won five states in the Deep South--a strong showing for a third party. LeMay was highly decorated by many countries, honored with the Air Medal, the Silver Star, the Distinguished Flying Cross, Distinguished Service Medal, the Legion d’honneur, and First Order of Merit with the grand Cordon of the Order of the Rising Sun. 1906 Nov 15th Born in Columbus, Ohio. 1928 Received B.S. in Civil Engineering from the Ohio State University. 1928 Joined the United States Army Air Corps.